This article is a review of a product known as Neurozan Plus. The manufacturer claims that this product has numerous nutrients that offer improved nutritional support. The nutrients contained in the product help to maintain normal brain and cognitive functions. You will learn more about this product and its suitability as you read further. Omega 3: contains DHA, which is essential for maintaining normal brain function. Thiamin (Vitamin B1) : maintains the normal functioning of the nervous system. Iron: ensures that cognitive functions occur normally. Iodine: ensures that cognitive functions happen normally. Zinc: ensures that cognitive functions take place normally. Vitamin B6: enhances normal nervous system function and psychological function. Vitamin B12: promotes normal nervous system function and improves psychological function. Vitamin C: ensures that psychological functions occur normally. Magnesium: promotes optimal psychological function. Pantothenic acid: contributes to the normal functioning of the brain. Selenium: promotes normal immune system function. Consumers are advised to take one capsule and one tablet per 24 hours. It can be taken with water or cold drinks during main meals. Chewing the tablets is highly discouraged. Neurozan Plus contains iron, which can cause harm to young children when taken in excess. The product also contains soya and fish oil. The manufacturer advises users who are allergic to soya and fish not to consume the product. It is recommended that users should seek professional assistance before using the product. These include users who are under the supervision of medics, pregnant women, breastfeeding mothers, and people who are allergic to products which are in the capsules. Exceeding the recommended dosage may cause harm. This product costs $25 on the company’s websites. Those who want to purchase it at a lower price can go to Amazon where it costs $20. This price is for a pack of 28 capsules and 28 tablets. It is a moderate price because it is neither too high nor too low. Based on the given prescription, it will take 28 days before a user purchases another pack. It is somewhat concerning that there is no information about money-back guarantee, which raises questions about what would happen if consumers are not satisfied with the performance of the product. Nevertheless, we were able to identify numerous positive reviews on the company’s website and Amazon. These reviews compensate the lack of a money-back guarantee and increase consumer confidence for those who wish to try the product. 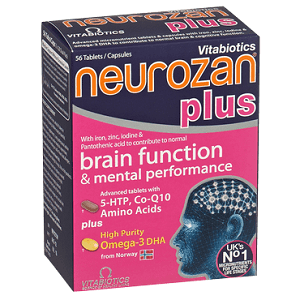 Neurozan Plus is a suitable product for consumers who wish to maintain normal brain and cognitive functions. The quality of the product is recommendable because of a strong formulation. Additionally users can trust this product based on the positive reviews of those who have used the product. However, there are significant demerits that users should be aware of like the absence of a money-back guarantee. Furthermore, Neurozan Plus is not an ideal product for vegetarians because some of its ingredients come from animals such as fish. Therefore, consumers who are allergic to some animal products may not consider purchasing this product. Henry Costa	reviewed Neurozan Plus	on June 14th	 and gave it a rating of 3.